Hot Tub Collection by PDC Spas. Introduce yourself to relaxation and warm water therapy in the privacy of your own home with a PDC Spas hot tub. Every PDC Spa is custom built in America to deliver exceptional comfort, performance, energy efficiency and longevity. Body contoured seating and targeted massage jets will soothe aches and pains from your neck to your toes and ease stress as you spend quality time with family and friends. Exceeding energy standards by as much as 33% and backed by an unsurpassed 35 year warranty, a PDC hot tub has your long-term satisfaction in mind. With 3 unique collections, you'll find the perfect hot tub for your health, wellness and budget. Swim & Fitness Spa Collection by PDC Spas. Achieve the improved health and well-being you crave with a PDC swim or fitness spa. Our diverse collection of 15' to 19' dual zone swim spa models provide ample space for exercise or leisure and include body sculpted, massage seats for targeted hydrotherapy. Space saving 12' and 15' fitness spas are the perfect fit for any lifestyle. Open your home to the endless possibilities of year round fitness, relaxation and family enjoyment with a swim spa. The TruSwim® patent pending propulsion delivers an unparalleled experience with the widest, smoothest current available. The adjustable, even resistance and unobstructed fitness area is ideal for a variety of activities and athletes of any level. The Synergy swim and Vitality fitness series provide a powerful current for fitness and fun while the RX6 massage column offers full body relaxation for body and mind. 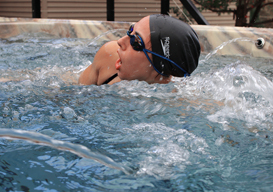 Achieve the improved health and well-being you crave with a PDC swim or fitness spa. Our diverse collection of 15' to 19' dual zone swim spa models provide ample space for exercise or leisure and include body sculpted, massage seats for targeted hydrotherapy. Space saving 12' and 15' fitness spas are the perfect fit for any lifestyle. Open your home to the endless possibilities of year round fitness, relaxation and family enjoyment with a swim spa.